Address: 303943 Orlovskaya obl., Khotynetsky r-n, pos. Zhudro. 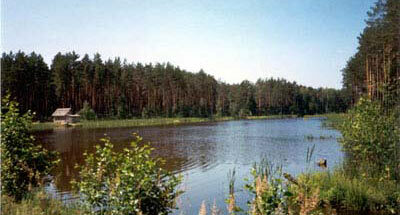 National Park Orlovskoye Polesye is situated in the Znamensky and Khotynetsky Districts of Orlovskaya Region. The Park was founded in 1994. Its area is 77,7 thousand ha. On the north and on the west the Park borders Kaluzhskaya and Bryanskaya Regions. 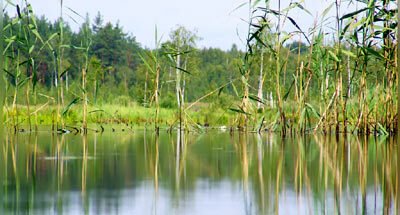 It is situated in the middle of the Srednyerusskaya highland in the basin of the river Vytebet. The territory is a high hilly valley cut with ravines and gullies, with absolute height marks 220-250 m above the sea level. 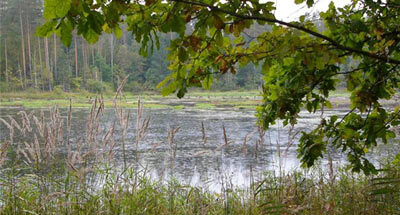 In the Park natural systems of island broad-leaved forests with characteristic flora and fauna are conserved. 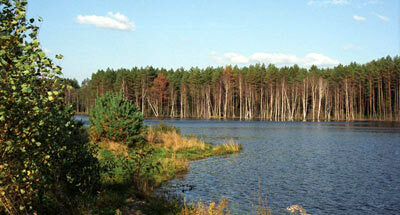 Forests occupy 33 thousand ha — it is the greatest forest area of Orlovskaya Region. In the forests communities there can be met pine and spruce forests, coniferous broad-leaved forests and broad-leaved forests with a predomination of lime, mixed with some Norway maple, oak, and ash. There are black alder forests. In the left-bank forests along the Vytebet in the low lying areas muskegs with cranberry are developed, being here on the southern and south-eastern border of their habitat. Of species which need protection notable are the Dactylorhiza. For the animal world elk, roe, wild boar, otter, marten, Eurasian shrewmouse, alpine hare, European hare, and beaver are characteristic. The existence of musk-rat is possible — a species in the Red Data Book of the Russian Federation. Since 1996, a free bison population lives on the Park territory. Of birds (with a total of 130 nesting bird species) there are to be encountered wood grouse and hazel grouse; owls are numerous (Tengmalm's and little owls, gray owl, long-eared owl), as are day predatory birds. Among rare bird species the serpent eagle is noted. There are memorial places connected with Turgenev's life and activity (Lgov town).